A very warm Saturday morning saw Lisa Young achieve a new Lytham Parkrun PB! An outstanding 34.32 for Lisa! Well Done! Karen Smith had a brilliant run and finished in a superb 33.47! Dave Young gets closer to his PB every week! A brilliant time of 24.39! Awesome! Gary Parkinson had a storming run in the heat! To totally superb time of 1.24.54! Great Running Gaz! The TCRC 8 had a storming run at the Hutton Roof Fell Race on Saturday! Roy Tomlinson led the way for team TCRC with a totally outstanding time of 1.10.01! A 7th category place and 90th overall! Well done Roy! Ben Brennan is coming back into some excellent form and this showed with a superb time of 1.19.05! The machine that is Lesley Gray! Les had a stunning run and was rewarded with a brilliant time of 1.24.18! Phil Hayes and Michelle Tomlinson fought it out right to the line! Outstanding performances by both and brilliant times of 1.41.02 and 1.41.03! Steve Burgess, again in fine form, ran an outstanding time of 1.41.31! Karl Lucas and Michael Gray ran brilliantly and supported each other around the very difficult course! Awesome times of 1.48.49/1.48.50! Well done Lads! Captain Dave Barras, in his first ever half iron man distance (1.2 mile open water swim, 56 mile bike and 13.1 mile run) showed just how awesome he is! This time last year, Dave was not a confident swimmer! 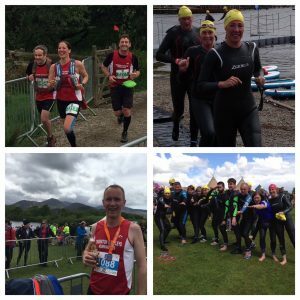 Over 12 months he has worked hard and raced his first open water swim last weekend at Keswick! His achievement on Sunday is just amazing! We are very proud of all the work you have put in and that you got a brilliant result! Well done on a 6.06.38 time! Go Dave! Steve Burgess continues to excel on the off road races! A Fantastic time of 48.09 saw Steve cross the line in 41st Place! Well done! Michael Gray had a storming run and a 55th place finish in 54.45! Superb! Mike Hall ran a great race and a 3rd V45 place in a time of 37.12 and 8th position overall! Well done! Following the results of the club vote last Tuesday, TCRC will now move to its new location at Pool Foot Training Ground. Tuesday Club runs will now start at Pool Foot at 7pm from the 7th June! Please remember, if you wish to sit in the bar afterwards you must have showered, or changed into different clothing! Dave Young is currently looking at different options for the Club Handicap. The next Club Handicap is the championship trophy, so will be using the current course. Next Thursday (09/06/2016) is the 3rd Interclub of the series! 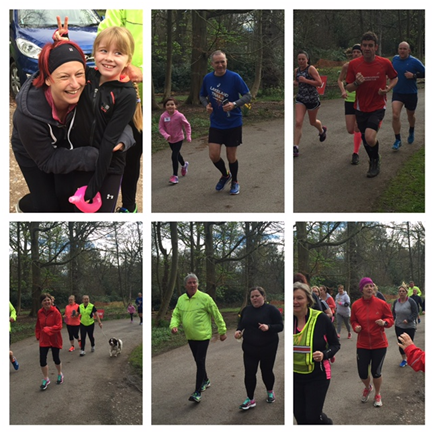 Over the last 3 weeks our most amazing newbies have been training to achieve the 5 mile target! They not only achieved it, but totally smashed it! Club vests/tops have been purchased and Lytham will be a sea of red! We would really like to go in mass to Lytham and show just what an amazing club we are! So, get that vest ready… Lytham, we are coming! Your club captains will be sending out further details early next week and making sure that you are all registered! You must be a club member and be EA registered to run. An invite to all members will be sent out in the coming weeks, along with any documentation that we need to bring to your attention, prior to the meeting. This is your club and we want to hear what you would like to see the club achieve over the next 12 months. To allow us to look at this, a questionnaire will be sent to all members in the coming weeks. It is an ideal opportunity to have your say and put forward any views, requests or observations. Club Chairman – If you would like to put yourself forward for this role can you please contact Bev Foster. A full list of the Club Championships for both road and trail, are on the website. For all future races, links are provided. You must register as Thornton Cleveleys Running Club for all club championship events! 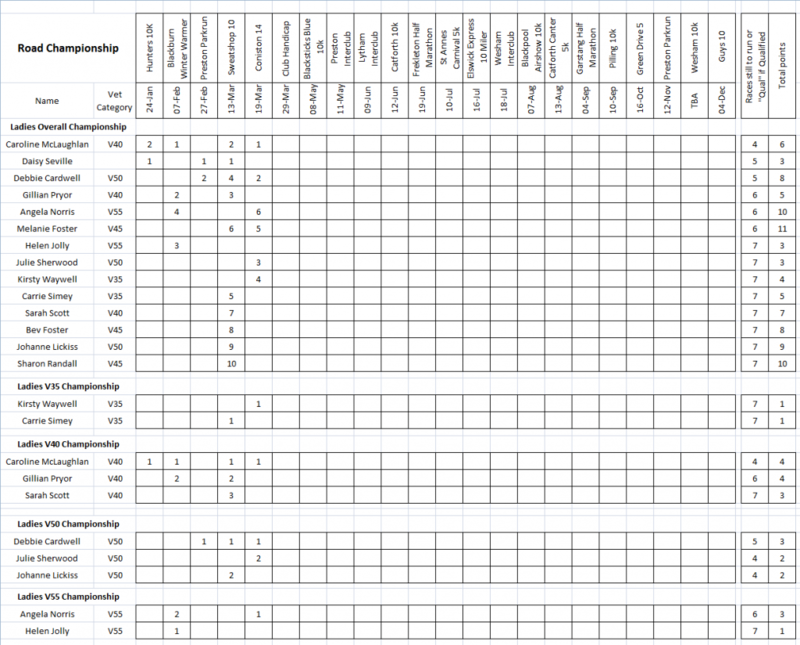 Please make sure you check the club championship table and let Roy Tomlinson know if you have any questions! Please DO NOT leave it till the end of the championship to report any issues! The next club handicap is Tuesday the 28th June and will be the Handicap trophy race. To be eligible, you must have run at least 2 handicaps between January and May. More details will be sent out via email nearer the time. If you are unable to run and are able to marshal, can you please let us know, we will be requiring more marshalls than usual for this month’s race. If you are not getting any notifications by email, please let me know. We will be sending lots of important information out over the coming weeks, we don’t want you to miss out! Please try and park on the road on a Tuesday/Thursday evening, or car share if possible! If you race, tell me about it! We cannot celebrate your success if you don’t tell anyone! Send your results and pictures to me! These do not have to just be club races! All results will be celebrated! If you are running on a weekend, why not post it on Facebook? This weekend again saw lots of groups running varying distances. Running with Friends! Well done to all those racing, training or just enjoying the outdoors this weekend! Triathlon: Individual – The one-woman machine that is Lesley Gray – she swam, biked and ran to glory! A totally amazing day for Les and a well deserved 3rd place finish! 1.14.22 for all three disciplines! The Olympic team awaits! 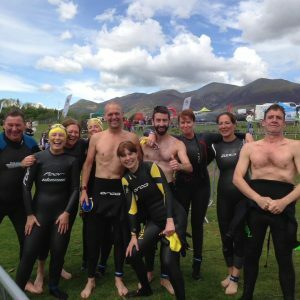 Julie Sherwood in her first ever open water triathlon was amazing! A brilliant time of 1.43.15! Go Julie! 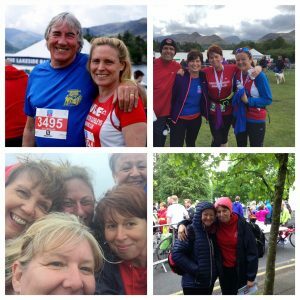 Triathlon: Team – TCRC angels – Karen Livesey, Sharon Randall and Lisa Young! Karen Livesey had only swam 3 times in open water until Saturday and totally smashed the 400m course! Sharon Randall had a storming bike leg and Lisa Young ran one of her fastest 5k times! A vet 3rd place team finish for the amazing ladies! Go Team! 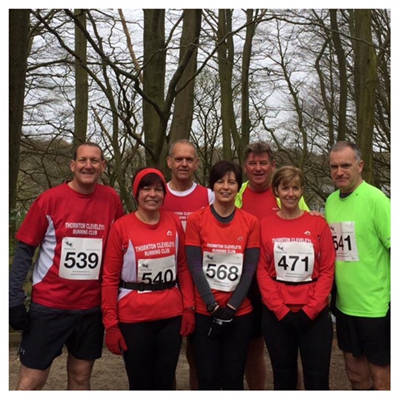 5K Trail Run – After 4 weeks of resting, Andy Fairbairn pulled it out of the bag for team TCRC! A top 10 position for Andy in a superb time of 23.11! Brilliant! Dave Jones also enjoyed the race coming home in a great time of 35.00. Well done! 25K Trail Run – There was no sunshine at the beginning of the 25K trail race! Wind and Rain greeted the TCRC 16! Due to a road crossing, most of the TCRC crew spent up to 24 mins waiting to cross! The course was extremely technical and had over 2500ft of climbing! Roy Tomlinson made light work of the route and totally smashed out a time of 2.28.56! Jenny Clark had a brilliant run and crossed the line in an outstanding time of 2.39.12! David Barras had no problems with the climbs and ran a superb time of 3.00.02! Caroline McLaughlin, Steve Livesey and Joe Tyldesley ran together and not only enjoyed the route but ran awesome times of 3.05! Colin Denney had a storming run! An awesome time of 3.27.13! Michelle Tomlinson ran brilliantly and was rewarded with a fantastic 3.45.25! Steve Burgess loves the trails! An excellent time of 3.59.53! Bev Foster had an epic run, which saw her post a most brilliant time of 4.06.53! Melanie Foster loved the trails and ran a superb time of 4.15.56! Sarah Scott and Janine Denney ran together (much laughter), finishing in a totally brilliant time of 4.19.01. Kirsty Waywell and Christine Burgess kept each other company and smashed out times of 4.23.44 and 4.37.40! Simon Mason brought the team home in a superb time of 5.00.53! Well done Team! 50K Trail Run – A 6 am start saw Leon Flesher and Pete Waywell run the brutal 50K trail run! After running the course last year, both Leon and Pete totally smashed their times! A truly remarkable time for both amazing men! 6.04.22 for Leon and 6.18.23 for Pete! There are not enough words to use to praise these times and the effort put in by both of them! We salute you both! 10K Trail Run – The 10K trail run required a ferry crossing before the start of the race and saw the first half of the race with upward climbs! After running the 25K race on the Saturday, Michelle Tomlinson decided to run the 10K! This awesome lady ran a brilliant time of 1.08.35! Well done Michelle! Julie Sherwood looked great following her awesome triathlon on Saturday! A superb time of 1.13.20! In his first ever trail 10K, Mike Gray had a storming run ! A brilliant time of 1.22.55! Karen Livesey smashed her time from last year! 1.36.01 for the awesome lady! Malc Sherwood had a superb run and brought the team home in a great time of 1.55.58! Well Done! 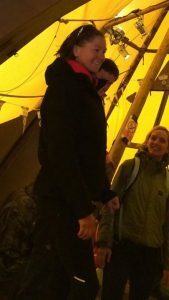 So… What really happened when TCRC went on tour…..
Dave Barros will now be formally known as Judas… after 12 miles of lovely group running, Dave decided that he would spend the last few miles on his own! However, by giving a salute to Caroline, Joe and Steve he felt he had done enough to say goodbye. Imagine their surprise when they reached the top of the hill to find him nowhere in sight and that he had taken the pork pies with him! Dave also had an issue with the open water swim! Not content on following everyone else, he decided to make his own route and was kindly stopped by the canoe marshals who could not understand how he was so far away from everyone else! I (Sarah) looked like bambi coming down all the trail hills, and I mean all of them! Don’t run with me and Janine Denney! After deciding that she had done enough hills, Janine fancied a bit of downhill, so kindly took us right and not left where everyone else went! Luckily two people who we had previously overtook gave us a shout and back up the hill we went! Trainers stuck in the mud and lots of continuous swearing by some! Colin Teflon Denney, still looking like he had been on a photo shoot after 16 miles of hell! Colin will be on the cover of Sports illustrated next month! Melanie Foster doing her best Paula Radcliffe impression ;-)! Rather than running across the river crossing, on no…. Bev Foster took the lead and had the ladies going across a half made bridge that was covered in “do not use” tape! Steve Livesey deciding that he was going to have a t shirt and that a woman’s small would fit him – reader’s wives front cover for next month! See what you all missed! Next year team TCRC will be there in force….. much fun ahead! 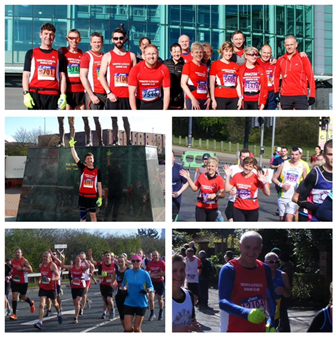 The sun was shining on Gillian Prior at the Manchester 10K! A superb time of 52.00! Well Done Gillian! Daisy Seville had a storming run! sub 45 mins and 68th position! A superb time of 44.54! Well Done! Janine McNeill is making fantastic progress following injury and ran a brilliant time of 1.00.04! Great Running! Nothing phases Debbie Cardwell! A very hot day and an undulating course was no problem for the little speedster! A brilliant time of 4.29! Outstanding running Debbie! Well Done! Tuesday – Club run from YMCA Thornton! meeting at 6.45pm, ready to run at 7pm! Please ensure that you have a group to run with, prior to leaving the YMCA. Thursday – Speed training this week is from YMCA Thornton! 1-mile speed loops await! Meeting at 6.45pm, warm up at 7pm. All Speed sessions are structured to ensure that all abilities can attend the sessions. Speed Training – The Future! Over the summer months (I’m not promising sunshine) speed sessions will be timed. This will show the amazing progress you will have made! Predicted mile and two mile loops (you predict your time for a distance, no watches allowed and the closest wins a prize) good fun along the prom. Hill training.. Fleetwood mount and Blackpool prom. To ensure that you qualify for the club handicap trophy, you must run at least two handicaps between January and May! The next club handicap is Tuesday the 31st May. If you are unable to run and are able to marshal, can you please let us know. 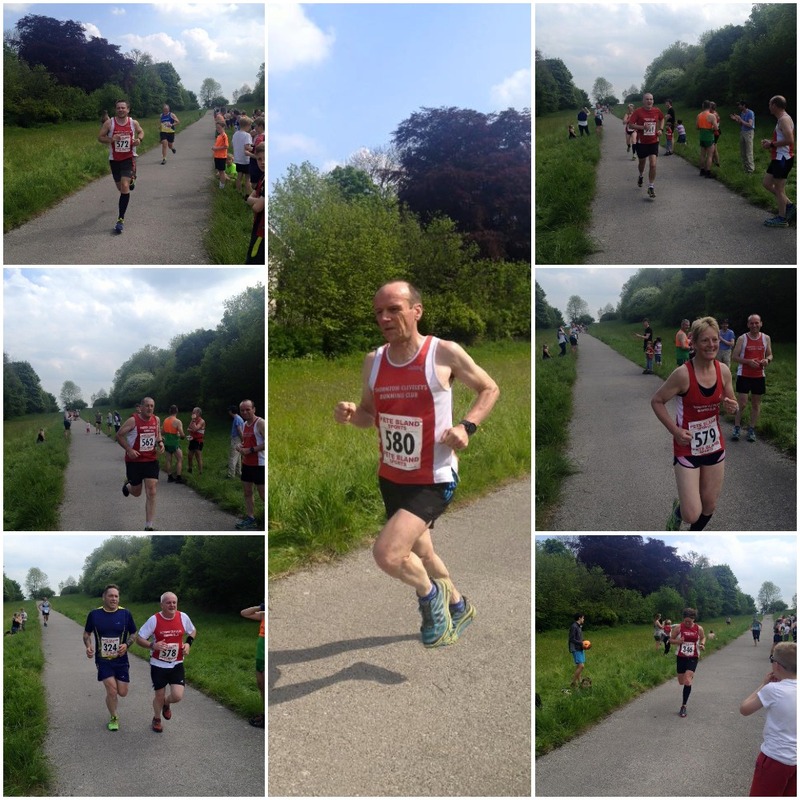 Preston Harriers Interclub – Well done to all those that participated at the second Interclub of the season! Captain David Barras was the first finisher for TCRC in a totally superb time of 24.30! Well done Dave! Peter Waywell had a storming run and made light work of the undulating course. A time of 25.35 for Pete! Roy Tomlinson ran a great race and was rewarded with a fabulous time of 26.33. Joe Tyldesley is coming back to amazing form and showed true determination to run under 27 mins! A brilliant time of 26.49! Steve Livesey is on brilliant form and ran a great race – 27.26 for Steve, well done! First lady for TCRC was the ever smiling Daisy Seville. Great running by Daisy and a superb time of 29.47! Well done! Welcome back Lesley Gray! A fantastic run by Lesley following injury! A superb time of 31.37! Michelle Tomlinson continues to get faster each run! A brilliant time of 32.29! Gillian Prior ran a great race and crossed the line in an awesome time of 33.07! Andy Whitlam continues to improve each run! A brilliant time of 35.08! Karl Lucas is enjoying his running and this shows in the times he is posting! A fabulous time of 37.22! Dave Jones enjoyed the evening and ran well for the team! A great time of 37.29! Bev Foster had a great run and crossed the line in a fantastic time of 38.46! In her first interclub and competitive race for TCRC after moving from the beginners group, Debbie Hindley had an outstanding run! A brilliant time of 40.02! Well done Debbie! Mike Grey ran a great race and posted an excellent time of 41.53! Hilary Goorney ran well and ensured that the ladies finished with a flourish! A brilliant time of 43.32! Bringing team TCRC home was the brilliant Mike Walsh! 46.15 for the main man! Well done Mike! 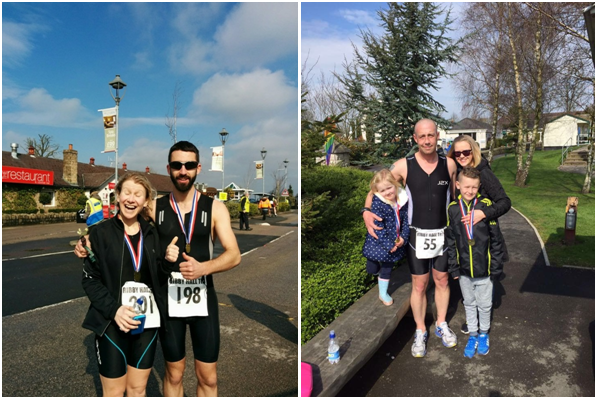 Worden Park 10K – Well done to Karl Lucas! A brilliant time of 58.33! Great running Karl! Tuesday – Club run from POOLFOOT meeting at 6.45pm – ready to run at 7pm. Please make sure that you have a group to run with, prior to leaving. Thursday – Speed training this week is from Fleetwood Mount. ½ mile timed loops await! Meeting at 6.45pm, warm up at 7pm. Some of you are aware that the club have approached Fleetwood Town Football Club with regards their new training ground and the possibility of TCRC meeting there. This is located in Thornton as shown on the map below. The FTFC training ground at Poolfoot has a new building containing changing rooms, a bar and meeting rooms. As a committee we are keen to develop the social side of TCRC and so would like to invite you all to come to a club night and try out the facilities. So, Tuesday 17th May we will be meeting at 6.45 pm (to run at 7) in the bar area at Poolfoot. This will give everyone the opportunity to try out the changing rooms, running routes and then have a drink in the bar. There is off road parking at Poolfoot we can use. Over the following week we will then ask club members to vote on the meeting place for TCRC. Either to remain at the YMCA or move to Poolfoot. Postal address – Fuse Football, Butts Road, Thornton-Cleveleys, FY5 4HX. There will be no one running from YMCA on the 17th. (Although someone will be there to redirect club members). A full list of the Club Championships for both road and trail, are on the website. 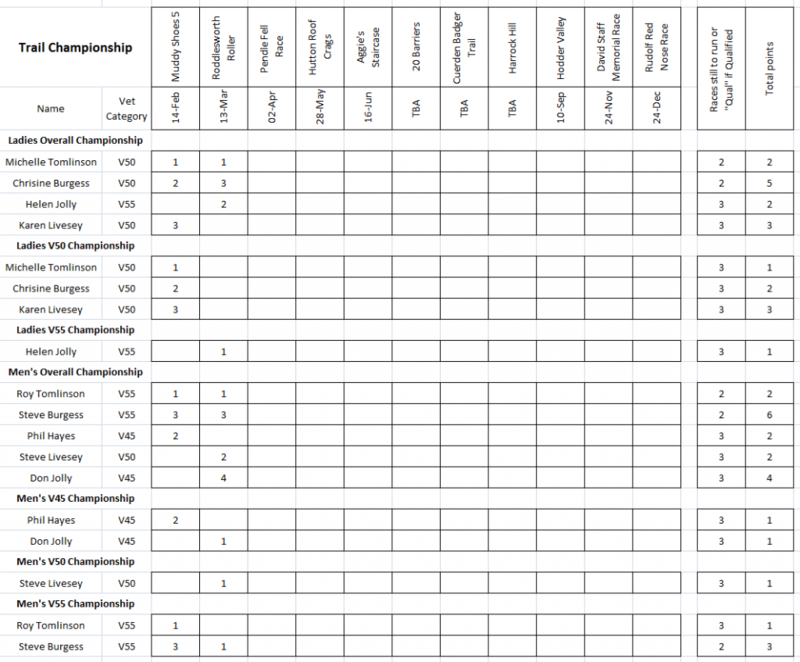 This year we have changed how the championship works. This year – A total of 8 races from the list of published road races needs to be completed. The choice of race distance is totally up to the individual, with only a requirement to complete 8 races! There are free races on the club championship – Parkrun, Club Handicap and the Interclub Series! The points system will work in the same way! Each participating individual will be awarded points against the position that they finish. The trail championship has not changed! 4 races and you qualify! Please can you let Roy and myself know if you have taken part in any club race, as we have a few members that are also part of Fylde Coast Running and we would only filter on TCRC results. Don’t forget that you are EA registered and this allows you run as an affiliated member. 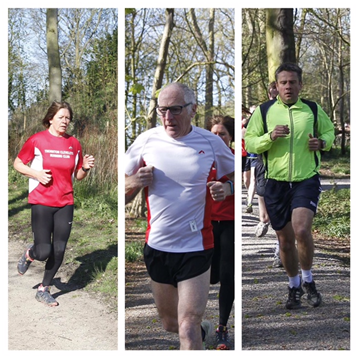 Lytham Parkrun – A sunny Saturday morning in Lytham saw some great times from the TCRC crew! Ben Brennan had a fabulous top 20 finish, in a superb time of 22.03! Dave Young continues to show his great running form and finished in an outstanding time of 24.25! A massive welcome back to Lesley Gray, following a recent injury which kept her out of Manchester! A most amazing time of 24.43! Well done Les! Catherine Fletcher had a brilliant run and was rewarded with a superb time of 33.55! Wray Scarecrow 10K – Janine McNeil had a brilliant run on the undulating course and rightly deserved the fabulous time of 1.02! Well done Janine! 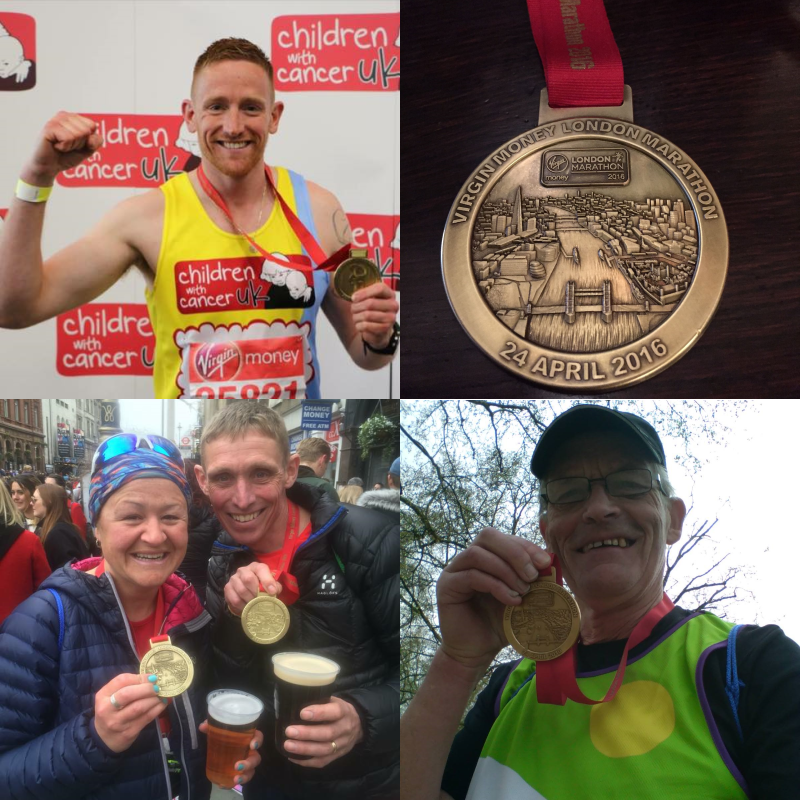 London Marathon – 11 of TCRC’s finest showed the London course how it should be run! Leon Fletcher, in his second marathon in the space of 14 days, raced to perfection! A 2.58.35 time saw Leon again smash the magic 3-hour barrier! Stand Proud Leon! Martin Boswell ran the perfect race to achieve his target of a sub 3 marathon! A totally superb time of 2.58.51 was so deserved! Well done Martin, amazing running! The amazing Roy Tomlinson, not only beat the great Kelly Holmes, but ran a brilliant time of 3.09.30! This most awesome time gave Roy a 54th age group position! Amazing! Great Running Roy! Nothing Phases Pete Waywell and he took London in his stride. A second marathon in 14 days saw a most amazing time from Pete; 3.13.33 and a big smile from the ultra-athlete! James Duffy in his first ever marathon had a storming run! A 3.18.37 finishing time! Well Done James, brilliant running! Jenny “the machine” Clarke… Totally smashed her PB and ran a negative split in the process! A totally awesome time of 3.20.26 saw Jenny cross the line with her gorgeous smile! Well deserved! Go Jenny! After months of struggling with a knee injury, awesome Andy Fairbairn not only achieved his target time but he did it in style! A negative split run and a totally superb time of 3.26.23! Rest easy now Mr Brilliant! Steve Brooks crossed the line in a totally outstanding time of 3.42.31! After running 2 weeks ago in Manchester and picking up a leg injury, Steve took the decision to still run at London for his charity! With great determination, a big smile and just a totally fabulous running! Well done Steve! Kirsty Waywell had the most amazing run. This fabulous lady knocked 21 minutes off her PB and did it in style in 4 hrs 58! After looking after most of the club and ensuring that they got to the start line, Kirsty showed just how brilliant she is! After struggling with injury and illness Dave Jones ran a brilliant race! A fantastic time of 5.23.41! Well done Dave, fantastic determination! Hilary Goorney, what can you say apart from Flipping Amazing! A superb time of 5.44.40 gave Hilary a 27th age group position! What an amazing achievement! Well done! London Marathon 2016 – more pictures next week. 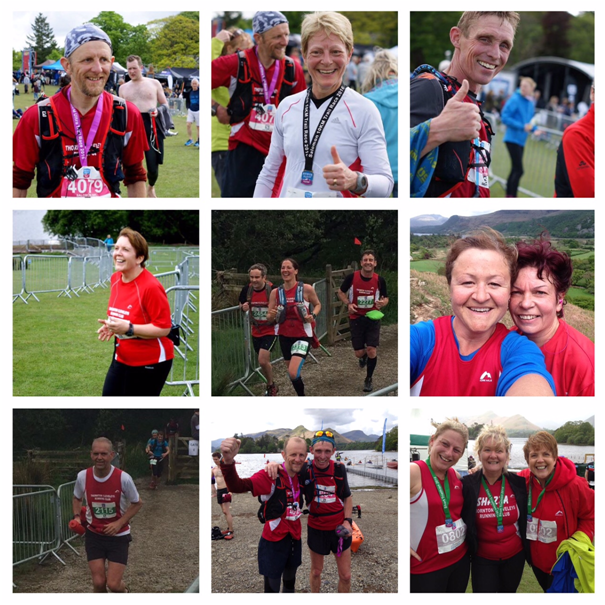 Thank you to all the TCRC support crew – Lisa, Michelle, Tom, Ellie, Megan and all families! 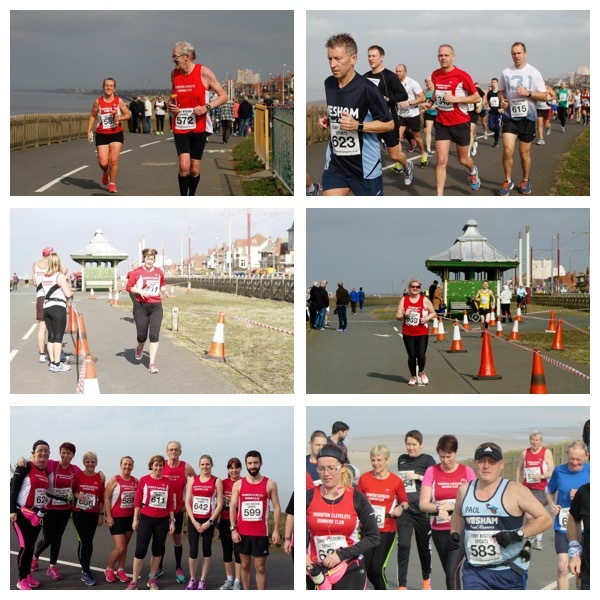 Blackpool Marathon: 100 not out! – What is there to say about the man that is Brian Cumpsty! The man that will run with anyone to get them to their target time and inspires other, hit the target of 100 marathons! Banners, cheering TCRC members and not an emu in sight! Brian ran his 100th marathon in memory of his Dad! What a proud day for Brian, his family and his TCRC friends! A time of 3.35.44 took Brian into the 100 club and we could not be prouder! Thank you to Dave Barras for his gift and to Caroline for running parts with him! Blackpool half Marathon – Not the normal conditions associated with a run in Blackpool – even the sun popped out! Fantastic running by the TCRC crew and even a PB! Gillian Prior had a fantastic run and smashed the 13.1 mile course in a brilliant time of 1.48.51! Well done Gillian! Kirstie Whyatt obliterated her PB and crossed the line with the biggest of smiles in a time of 2.03.28! Outstanding effort! Debbie Cardwell nearing the end of her marathon training, used the event as a training run! The last 3 miles saw Debbie run with Kirstie to the finish and cross the line in a brilliant 2.03.39! Great team work! Karl Lucas running his first ever half marathon had the most amazing run! A time of 2.05.27 saw Karl close in on the magic 2 hr target! Well done Karl, great running! 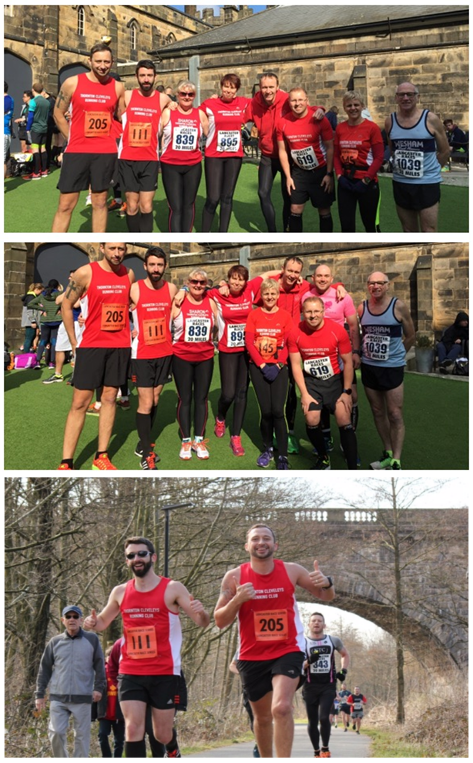 Rivington 10m Trail Challenge – The spectacular 7 stood together on the start line of the Rivington 10 mile Trail Challenge! Mr Cool – Colin Denny, showed just how much he loves the trail! A brilliant time of 1.40.21! Well done Colin! Steve Burgess continues to impress in a superb time of 1.46.12! After months of injury, Janine Denny had a brilliant run and produced an amazing time! 1.58.15 saw Janine smash the 2 hour mark! Christine Burgess excels on the trails and Rivington was no exception. A fabulous time of 2.07.03! Bev Foster and Simon Mason tackled the undulation course together! A totally superb time of 2.22.02! Well done! Unfortunately, Phil Hayes had to take the hard decision to pull out from the race, so not to aggravate a current injury! Great determination Phil and we wish you a speedy recovery! Tuesday – Club Handicap, meeting at the YMCA at 6.45pm for registration! If you are able to marshal, please let me know! After club sessions, we meet at the Tramways Pub in Cleveleys! Showers are available at the YMCA but often most people just come straight from the session (we are a clean bunch). People are there from around 8pm, so come and have a drink, even a snack if you need it! We would love to see more people after the club night! Membership fees for 2016 – 2017 are now due. Or you can print a membership form and bring cash/cheque to the club. To ensure that you qualify for the club handicap trophy, you must run at least two handicaps between January and May! The next club handicap is Tuesday the 26th April. If you are unable to run and are able to marshal, can you please let us know. 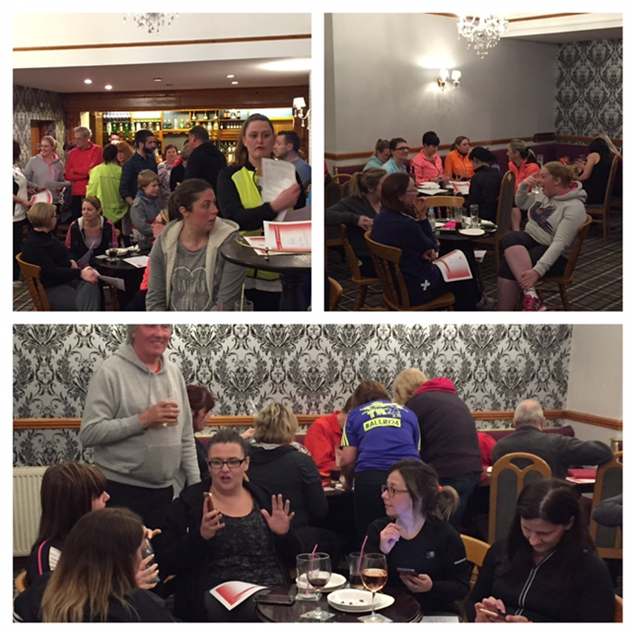 Blackpool InterClub – The first interclub of the season was at Blackpool. Due to the marathon on the Sunday we did not have the number of runners we would have normally have seen for team TCRC. First for the team was the superb Captain Dave Barras in a brilliant time of 24.15! Andy Fairbairn continues to show great determination through injury and crossed the line in an outstanding 25.01. Roy Tomlinson continues to impress in a brilliant time of 26.26! Steve Livesey, who steps up a gear at the interclub events, smashed a time out of 27.39! First outing of the season sees our brilliant youngster Tom Woods run an awesome time of 27.50. First Lady for Team TCRC was the brilliant Daisy Seville. A fantastic run sees Daisy post a time of 29.30! Alex Ingham continues to progress in his running and records a brilliant time of 30.59! Nothing phases Colin Denny and a brilliant time of 31.17 is well deserved. Phil Hayes continues to make progress with an existing injury and posts a great time for the team in 31.59. The superb Gillian Prior ensures that they ladies score well and records a great time of 32.32! Steve Burgess is coming into great form and runs a brilliant 33.13! Debbie Cardwell, deep into marathon training, runs a superb race in 33.58. Karl Lucas continues to impress in a brilliant time of 36.27. Julie Sherwood had a great run in a brilliant time of 37.19. Returning from injury, we welcome back Janine McNeil, who had a superb run in 37.38. Angela Norris ran a great race for the women and recorded a brilliant 38.06. Christine Burgess ran a perfect race and was rewarded with a brilliant 40.08. Hilary Goorney ran a superb last loop to finish in a great time of 42.02. The man himself, Mike Walsh, brought team TCRC home in brilliant 45.54! 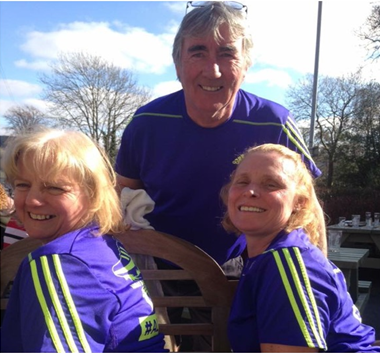 Lytham Park Run – A crisp morning saw TCRC stand on the start line at the Lytham Parkrun, side by side with our amazing beginners group! After 12 weeks of group runs, homework runs and achieving the impossible, this was their time to shine! Not only did they shine but they totally smashed it! I have done my best to try and include everyone that ran on Saturday and if I have missed you, I sincerely apologise! Roy Tomlinson was the first TCRC member home in a totally awesome PB time of 19.55! Fantastic! Steve Livesey enjoyed his first parkrun and ran a perfectly timed race, finishing in a brilliant 21.29! Alex Ingham continues to impress and ran a fabulous 23.20! Steve Burgess is on fantastic form and smashed his PB! A brilliant time of 24.39! Well done Steve! Andy Whitlam had a great race and continues to make amazing progress. A great time of 25.37 was well deserved! Sarah Scott ran with her daughter Grace and had great trouble keeping up with her! A new PB for Grace in 27.23! Janine Denney had an amazing run! Janine is just coming back from injury and is making an amazing comeback 28.40 for the amazing lady! Debbie Hindley had an amazing run and ran a brilliant time of 30.34! Christine Burgess ran brilliantly and showed her current fabulous form. A great time of 30.50! Dave Jones had a great run in 31.14! Well done Dave! Audra McChrystal ran brilliant race to come home in a superb time of 31.35! Leona Parkinson ran brilliantly to finish in a time of 33.26! Go Leona! Faye Walker had an awesome run and finished with the biggest of smiles! A brilliant 33.29! Lynn Shaw crossed the line in a totally amazing time of 33.48! Well done Lynn! Jordann Bailey ran brilliantly to finish in a superb time of 34.19! Well done! Hayley Greenaway finished with the biggest of smiles and rightly so! A totally awesome time of 34.25! Catherine Fletcher ran superbly and was rewarded with a brilliant time of 34.37! Julie Morris had a brilliant run and crossed the line with a smile and an amazing time of 34.59! Susan Parker and Rachael Docherty ran a great race, finishing together in a totally superb time of 37.18! Go ladies! Catherine Maclachlan had a storming run, finishing in a brilliant 37.27! Dawn Hoggard ran brilliantly and smiled her way to a superb 37.39! Elaine Hayes had a brilliant run and deserved her fabulous time of 38.02! Claire Greaves ran beautifully and finished with the biggest of smiles in a brilliant 38.04! Lucinda Coughlan finished in an awesome time of 39.43! Go Lucinda, well done! Zoe Rogers showed great determination and was rewarded with an outstanding time of 40.03! Well done! Lisa Waterhouse ran brilliantly to finish in a superb time of 40.14. The amazing Simon Mason, encouraging the team all the way around, finished with Lisa, with the biggest of smiles! Thank you from those who you encouraged! Phil Hayes ran with his amazing daughter Caitlin! Well done Caitlin a brilliant time of 42.54! Lisa Hall had a great run and finished in a superb time of 43.14! Sarah Jane Jackson ran brilliantly and crossed the line in an outstanding 43.17! Anita Kent showed true determination and was supported by the amazing Lisa Young! A most brilliant time of 53.19! Well done! Bringing team TCRC home was the amazing Kate Fearon! A brilliant time of 57.04 for one determined lady! Thank you to Malc Sherwood for the support and encouragement! Well done to all! An amazing morning, with truly fantastic people! Go team! 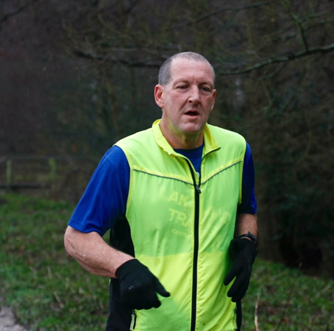 Lakeland Trail 17K – After not only his amazing running last weekend at Manchester, but his 5K early that morning, Steve Livesey showed how brilliant he is! A totally outstanding time of 1.38.58 saw Steve smash the Hawkshead route! Well done Steve! 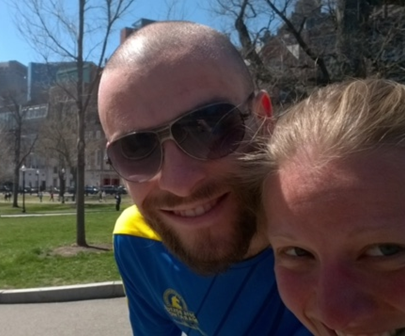 Boston Marathon – In 2015 Alex Fleming ran the race of his life! A 3.00.22 time at Manchester Marathon saw Alex qualify for Boston! After what has been a year of injury and illness, Alex headed off to Boston with his lovely wife Caroline. Alex took the hard decision to pull out of the race just after half way! Alex stood on the start line in Boston and deserved to be there. We all know how hard a decision this will have been for Alex and I for one am proud that he took his place on the start line! Alex we are proud of all you have achieved and all that you will go on to achieve! Stand Tall our fabulous and most awesome friend! Tuesday – Tuesday is a club run, meeting at the YMCA at 6.45pm. Please make sure that you have a group to run with. Thursday – Meet at Marine Gardens, Fleetwood at 6.45pm. 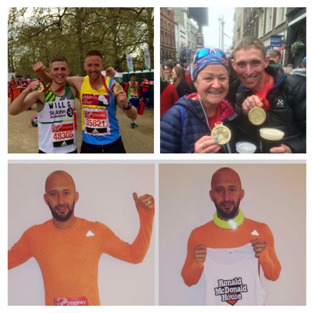 London Marathon – This weekend sees team TCRC head to the big smoke! Roy Tomlinson, Andrew Fairbairn, Jenny Clark, Kirsty Waywell, Pete Waywell, Dave Jones, James Duffy, Steve Brooks and Martin Boswell…. We salute you and wish you the best of luck! Support crew of Lisa young and Michelle Tomlinson, go Ladies! 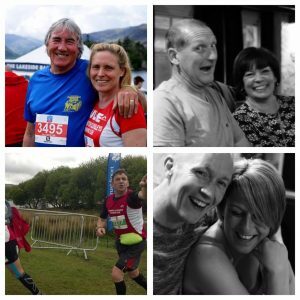 Blackpool Marathon – Brian Cumpsty will run his 100th Marathon on Sunday! An amazing achievement for an inspirational man! Go Brian! 12 weeks ago we stood in the YMCA with over 100 men and women who wanted to run! Over 12 weeks we have encouraged, been inspired and made new friends! 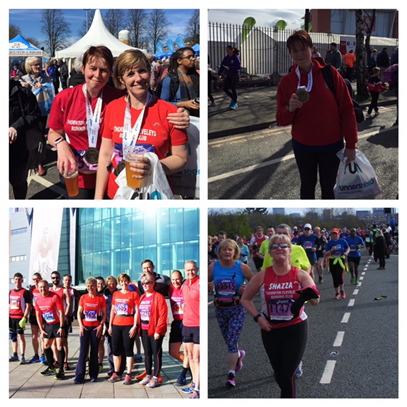 From running for 1 minute to running a full 5K, we could not be prouder of all that has been achieved! Tonight will see the beginners join the main TCRC club run! We are immensely happy that they have chosen team TCRC and we are proud to call them friends! Thank you to all of Team TCRC who gave up their Thursday night to help, inspire and encourage all that attended! 5K Times from Thursday Beginners Session at Stannah! We are looking for a new Chairman. If you are interested in this position, please speak with Julie/Malc Sherwood. We now have 4 teams for the Thunder Run event. £20 deposits are required as a matter of urgency! All deposits are to be given to Bev Foster! Cardiff Parkrun – Andy Whitlam is in superb form and smashed his way around the Cardiff Parkrun course in an outstanding 24.49! Well done Andy! 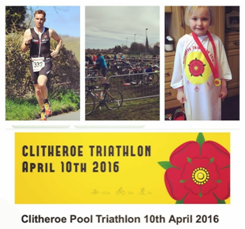 Clitheroe Triathlon – Karl Glover had a storming day at the Clitheroe Triathlon, finishing in an outstanding 53rd Place! Great Work Karl! 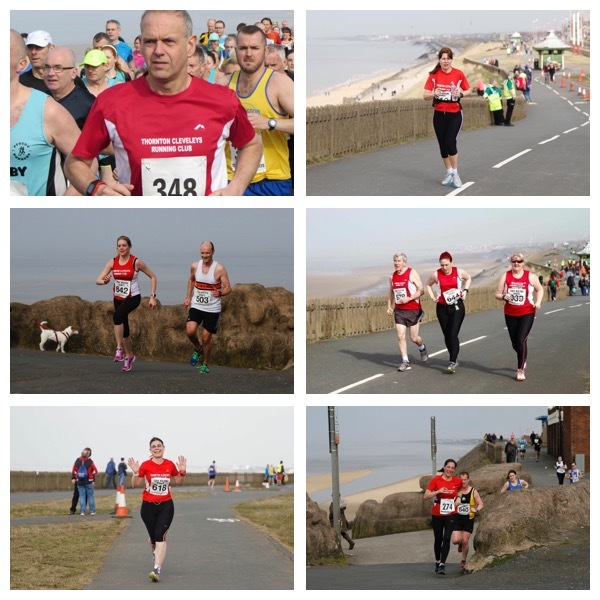 Fleetwood 10K – Gary Parkinson in his first 10k race, smashed 50 mins! A brilliant time of 48.23! Well done Gary! Gillian Prior also had a great race, crossing the line in a brilliant time of 49.39! Well done Gillian! After 16 weeks of training, the TCRC massive descended on Manchester! A motivational speech from Steve Livesey, random photo opportunities and a wandering Sarah Scott saw the team cross the start line! First to cross the finish line for TCRC was the most amazing Leon Flesher. Leon used Manchester as a warm up to his big event – London! Leon totally smashed the course in a sub 3 hour time – 2.59.25! Leon was 338th person to cross the line, in a field over nearly 11,000 athletes! David Barras showed just how awesome he is with a negative split marathon time! He smiled all the way around the course and totally smashed it, with an amazing time of 3.13.28! Steve Brooks, also using Manchester as a warm up, had a brilliant run! 3.28.46 saw him run a sub 3.30! Brilliant running Steve and we know you will smash London! Mr endurance himself Pete Waywell had a storming run and crossed the line in a superb 3.18.37! Brilliant running! After his heroics of last year, Steve Livesey ran a brilliant race! What makes his time even more fabulous is that after struggling with his knee for quite a while, he ran a totally outstanding time of 3.28.58! Good for age for Boston! Awesome! First Lady for TCRC was the superb Caroline McLaughlin! Manchester is just a stepping stone in Caroline’s ultra training, but she showed how fabulous she really is in a totally brilliant time of 3.31.12! Nice one Caz! After weeks of uncertainty Ben Brennan stood on the start line unsure of how the journey would go! Ben had the most amazing run and crossed the line in a truly superb time of 3.40.25! A new PB for Ben and one that is most certainly deserved! Great determination! Well done Ben! 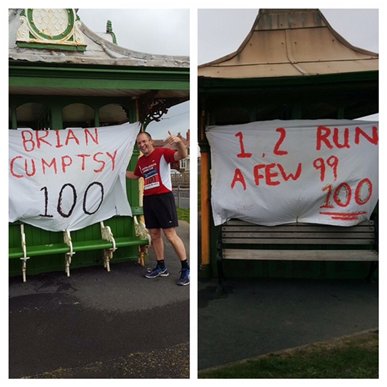 The marathon man himself Mr Brian Cumpsty crossed number 99 off his list! A most brilliant time of 3.43.42 saw him cross line with that famous smile!! In her first marathon Natali Harper had a storming run! A sub 4 hour run – 3.56.42! This awesome time gives Natali a good for age place! So well deserved and just a totally amazing time! Well done Natali! Michelle Tomlinson! After over a year out through injury, countless agonizing runs and the will to get to the start line, well she certainly did that! A sub 4 hour marathon! 3.59.16! Not only an amazing time, but a time for Boston! Well done Michelle! Totally flipping Awesome! Alex Ingham, in his first marathon, showed his fabulous running ability! A perfectly paced race saw Alex home in a totally superb time of 4.13.33! Great determination and fantastic running! Well done Alex! Colin Denny, deciding at the last minute to take part, showed just how amazing he is! A brilliant time of 4.36.51! Superb running Colin! Sarah Scott showed true determination, after an injury forced her to run, jog, walk and crawl to the finish! A brilliant time of 4.39.02! Bev Foster trained hard and wanted a sub 5 hour marathon! She totally smashed 5 hours! An Awesome time of 4.42.09 saw her cross the line with the biggest of smiles! So well deserved and such inspirational running! Well done Bev! Garry Routledge had a totally superb run! A perfectly timed run with a brilliant finish! 4.47.18! Outstanding running Garry!! Well done!! Jo Lickiss in her very first marathon, not only broke the 5 hour mark but she did it in total style! A most amazing run from Jo! A superb time of 4.58.05! Well done Jo, flipping brilliant! Terry Poole showed true determination to finish the race in a brilliant time of 5.07.34! Well done Terry! Bringing team TCRC home was Sharon Randall. A new PB time of 6.39.13! Well done Sharon! Brilliant running! Well done also to our fantastic Dave Young! A totally amazing time of 4.00.07! Outstanding running! Wendy Clark had the perfect of races and smashed her time from Manchester last year! A 3.47.46 gives the amazing lady a place at next years London Marathon! Well done Wendy! The day itself was made even more special by the support crew! It is not easy being a supporter at these types of events but from the Manchester running crew, we salute you and say a MASSIVE THANK YOU! Lesley, Jackie, Janine, Lisa, Andy, Ellie, Roy, Simon, Karen, Malc and Julie….. THANK YOU!!!! Thursday – No Speed training this week. Meet at the YMCA at 6.45pm. This Thursday is the last beginner’s session! Can you help? The amazing group will be running a 5k course at Stannah, meeting at Stannah car park at 6.45pm. We really would appreciate if as many members as possible can attend. After the run we will be having a get together at the Ashley Club. 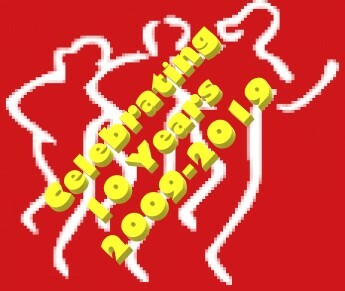 The evening is to celebrate the group’s achievements and also give them so more information about the club, whilst meeting other members and having a drink. This Saturday is the 5K Parkrun at Lytham. We would really like it if we could get lots of club members at the event to offer encouragement, cheer them on and if possible run the event. March Handicap – All handicap times are now on the website. Thank you to Mr Dave Young for his fabulous organisation and for giving up his time each month for the handicap event! We thank you Dave! Thanks to all the marshalls on the night and well done to all those who ran the course. Alex Ingham had a storming race and a new PB time of 25.08! Steve Dunn ran brilliantly and crossed the line in 25.23! Andy Whitlam, who improves week after week, ran a totally fantastic time of 28.12! Steve Robinson showed his great form in a fabulous 29.05. Carrie Simey continues to impress in a time of 29.23. Karl Lucas continues to improve in a time of 30.25! Sarah and Laura Reidy had a great run together to PB in 31.13! Beckie Davis ran a perfect race to finish in 32.58! Well Done Everyone! 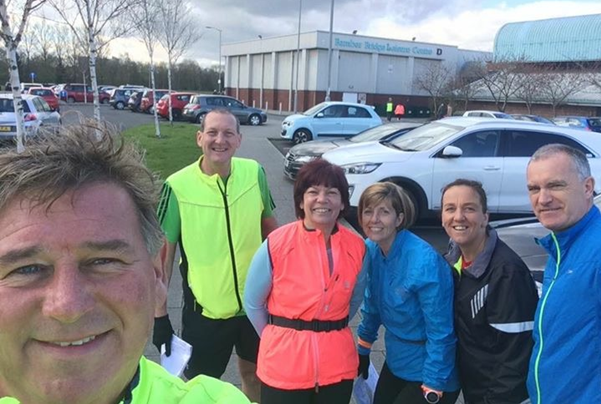 Lytham Park Run – Steve Burgess had a great Saturday Morning run on the “A” course at Lytham, with a fabulous time of 25.27! Christine Burgess and Kirsty Waywell running in their first run of the morning, crossed the line in a brilliant 32.12 and 32.13. All three ran further distances of 6 and 18 miles, following their morning at the Park Run! Well done! Pendle Hill Fell Race – Debbie Cardwell had an excellent race and ran the wet, muddy and challenging course in a totally outstanding time of 1.20.11! Well done Debbie! Ribby Hall Triathlon – The start of the triathlon race series saw Dave Barras, Sarah Wetherill and Michael Treece- Birch tackle the Ribby Hall course. Michael was the first across the line for TCRC in a most amazing time of 59.43! David Barras finished in a brilliant time of 1.04.57! Sarah Wetherill had an outstanding race, finishing 3rd in her age group and 4th woman overall – in a time of 1.04.43! Well done to all, fabulous times! Wednesday – Wednesday is the first interclub of the season and will be at Blackpool Stanley Park. Your club Captains – Sue Jones and Dave Barras will be sending out information on Facebook and Email regarding the finer details of the night! 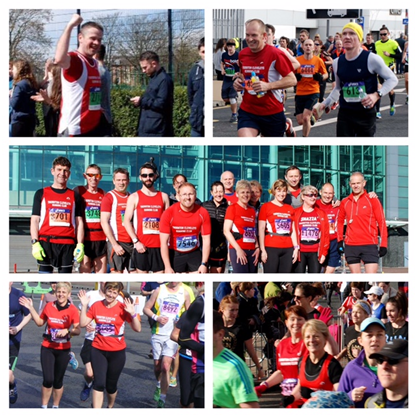 This Sunday is Manchester Marathon Day…..
After 16 weeks of training, members of TCRC will run the 26.2 mile course around Manchester, ending at the Cricket Ground. Start time is 9am and we hope for good weather! We will be having a get together celebration at the Castle Gardens Pub in Poulton from 3pm. Everyone is welcome! If you fancy a beer and some food, can you please let Steve or Ben know (or Email me/message on facebook). Thank you Steve and Ben for organising. If you fancy supporting on the day, Roy has created a fantastic timetable of roughly where people will be on the course. Let me know and I can send this over to you! CAN YOU HELP? – We would like some assistance for the next few Thursday evenings, as we are going to lose some of those who have assisted since the beginning, due to the Marathon. Please let me know if you are available. We have 2 weeks remaining of the beginners group and we are very excited to see them run the Lytham Park run at the end of the 12 weeks. At the end of the beginners course we will be having a get together on the Thursday evening at the Ashley Club. The evening is to celebrate the group’s achievements and also give them so more information about the club, whilst meeting other members and having a drink. 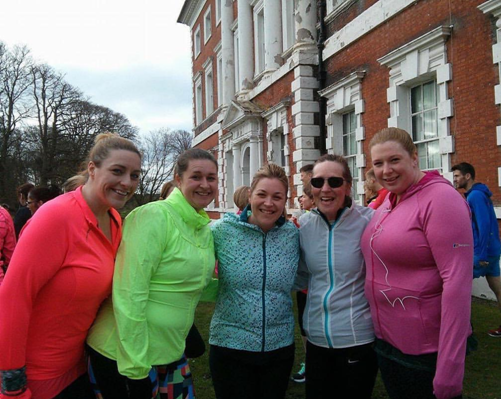 The Saturday after the last session will be the 5K Park Run at Lytham (16th April 2016). We would really like it if we could get lots of club members at the event to offer encouragement, cheer them on and if possible run the event. The progression that has been made in the last 10 weeks is fantastic. New friendships have been made and the impossible is becoming possible. If you’re on FaceBook and want to give them some extra encouragement the group is called TCRC Beginners. We would like to welcome Sue Jones, Alex Ingham and Gary Parkinson to the club committee. Sue will be organising the interclub events with Malc and Gary will be the new social secretary. Both positions will run until the AGM in June. Saturday saw 191 people tackle the “A” course at Lytham. Steve Robinson ran a great race and finished the course it a fantastic 25.19. Parkrun veteran Steve Burgess continues is his great form in an outstanding 26.15! Well Done! Tuesday – Tuesday is not only the club handicap race but also the latest in the road race championship. Registration is at 6.45pm at the YMCA. The committee all agreed on the below criteria, which would be implemented for the allocated place for 2017. Must have been a first claim member for a minimum of 12 months at the time of the draw, and be a fully paid up first claim club member and be affiliated to England Athletics. Must have entered and failed at the London Marathon ballot. We will need the rejection slip / email as proof. When running the London Marathon, the successful runner must wear the club vest, not their own or a charity vest. Must have either represented or marshalled (where we are asked to officially provide marshals including the TCRC Fairclough 5 Road Race) in at least 5 events, from inter club road race (7 races), cross country (6 races) or relays (1 or 2). Must not have been allocated a club place in the 5 years previously. However, priority will be given to members who have not had a London Marathon place in the last 5 years through any other means, i.e. not Good for Age, through the general ballot or a charity place. The committee decision will be final. I am sure you will in join me in saying a big thank you to our outgoing captain Mr Andrew Fairbairn. Andy has done an amazing job and worked very hard to ensure that the men have always been well represented! Thank you Andy! 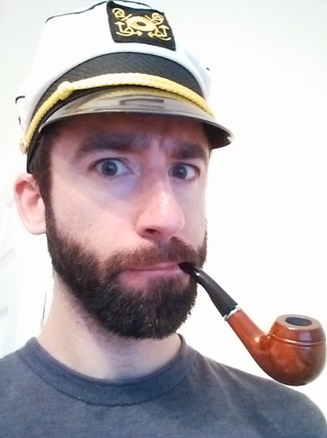 Meet your new captain… Mr David Barras! More to follow in next week’s report about Dave! Good Luck Dave and in the words of our ladies captain Sue Jones “bring it on”! Membership fees for 2016 – 2017 are due by April 1st 2016. We have 3 weeks remaining of the beginners group and we are very excited to see them run the Lytham Park run at the end of the 12 weeks. The progression that has been made in the last 9 weeks is fantastic. New friendships have been made and the impossible is becoming possible. The AGM will take place in June but we would really like to fill some of the current places on the committee – Social Secretary and 3 further places. We are also looking for a new Chairman. If you are interested in this position, please speak with Julie/Malc Sherwood. The Committee are also looking for someone to lead the TCRC Interclub organisation. If you can spare the time and would like to get involved. Please email Malc Sherwood or speak to a committee member. 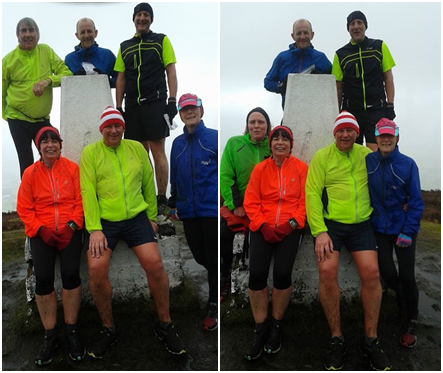 Coniston 14 – 10 TCRC members tamed the undulating course at Coniston and it became a day of PB’s! First home for TCRC was the fabulous Peter Waywell, who ran a perfect race to finish in a brilliant time of 1.35.15. Joining Pete in a top 100 finish, in a time of 1.36.20 was the awesome Roy Tomlinson. This time saw Roy rewarded with a V55 4th place finish! First lady home for TCRC was our Ladies Champion Caroline McLaughlin, in a totally fabulous time of 1.49.51. Caroline was rewarded with a 4th place V40 finish! Well done Caz! Debbie Cardwell had a storming run and completed the course in an outstanding 2.11.35. Queen of hills Julie Sherwood had a fantastic run and crossed the line in a great time of 2.18.34! Julie was closely followed by Kirsty Waywell, who smashed her PB time and posted a totally awesome time of 2.20.05. Mel Foster quickly followed in what was an outstanding PB time of 2.20.10! 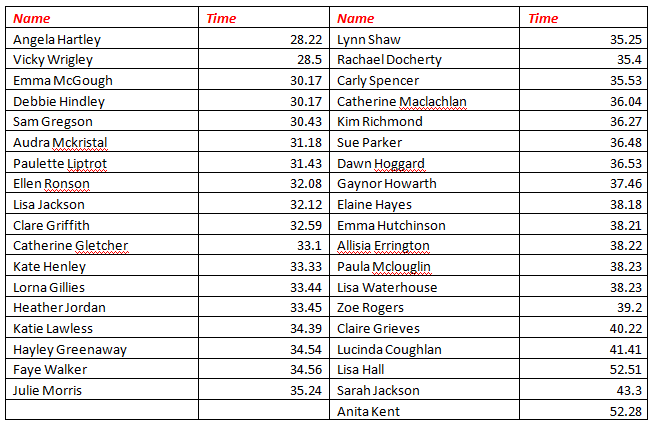 Well done Ladies on your outstanding PB times! Angela Norris had a superb run and showed her great form in a time of 2.21.08! Dave Jones ran a great race and finished in 2.28.25. Simon Mason ran a perfect race and showed true determination! A great time of 2.44.29 saw him obliterate his PB! 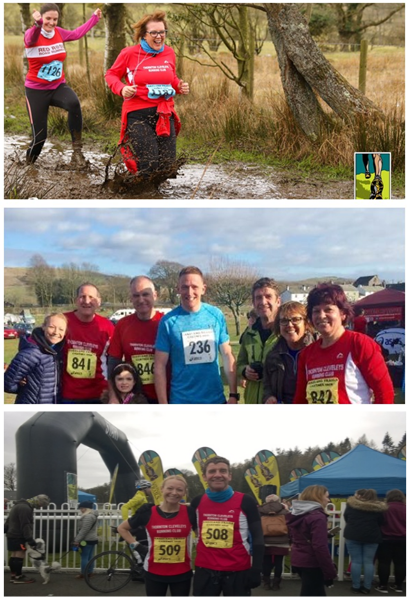 Cartmel Trail 18km Challenge – Saturday saw 3 races run at Cartmell and TCRC had representatives in each event! The 18Km challenge trail saw the outstanding Jenny Clarke finish 2nd lady, in a totally fabulous time of 1.34.37! Outstanding Result Jenny, well done!! Steve Livesey showed his excellent form and his love of the trails by completing the course in an awesome time of 1.40.01! Phil Hayes had a great run and finished in a fantastic time of 2.07.17. Steve Burgess continues on a great run of form and ran an outstanding time of 2.07.19. Christine Burgess, who is loving the trails, had a storming run and finished in a superb time of 2.29.06! Cartmel Trail 18km – Leon Flesher was first home for TCRC with an outstanding time of 1.25.06, great running Leon! James Duffy continues to improve each run and had a superb run in a fantastic time of 1.26.06! These times saw both lads finish in the top 25! Outstanding result! 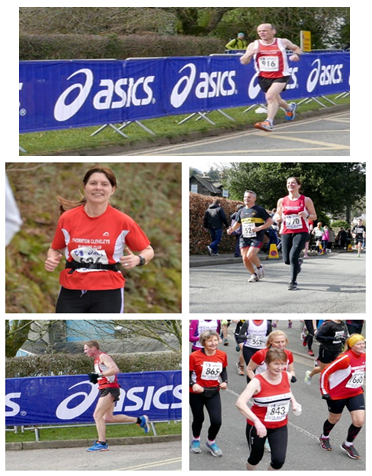 Cartmel Trail 10km – Karen Livesey totally smashed her trail 10k time in a most fabulous finish of 1.28.08! Go Karen! Gin Pit Marathon – Brian Cumpsy finished his 97th Marathon on Saturday in a brilliant time of 3.59! Brian went on to complete his 98th Marathon the very next day! Well done Brian! 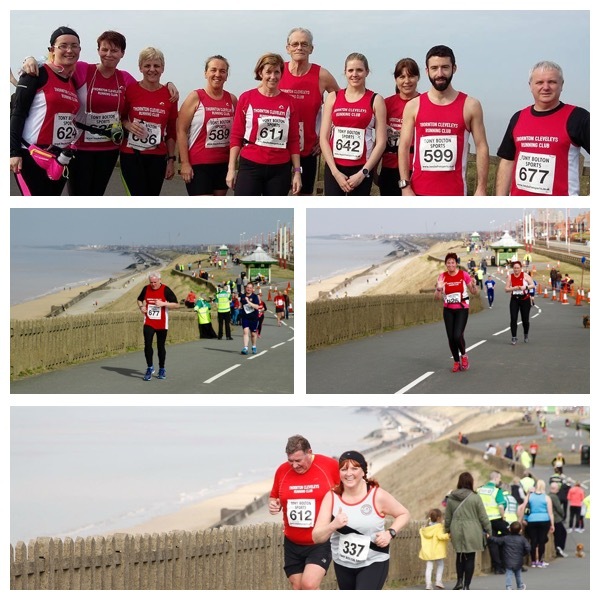 Fleetwood 10K – Daisy Seville had a storming run at Fleetwood 10k and crossed the line in an outstanding time of 45.31! Well done Daisy! Trimpell 20 – The Trimpell start was moved to Lancaster Castle this year, which created a very slow and congested half mile start and an up hill finish to the castle. Andy Fairbairn, still struggling with a niggling knee injury, ran a great time of 2.34.35 and was first home for TCRC. Andy was followed by Steve Brookes, who ran and outstanding race and crossed the line in 2.36.15. Steve was followed by the in form David Barras, who finished with a brilliant time of 2.38.03. Alex Ingham, training for his first marathon, finished in an outstanding time of 3.08.00! Sarah Scott had a storming run and smashed her PB, finishing in a fabulous time of 3.13.23. Jo Lickiss had a fantastic run and finished with a totally awesome time of 3.46.57. TCRC was brought home by the fabulous Sharon Randall in a great time of 4.38.44. Tuesday – Tuesday is a club run, meeting at the YMCA at 6.45pm, ready to run at 7pm. Please make sure you have a group to run with, prior to leaving the YMCA! The next race is the Club Handicap on 29th March! On Thursday evening we had 57 at the session. We have 4 weeks remaining of the beginners group and we are very excited to see them run the Lytham Park run at the end of the 12 weeks. The Saturday after the last session will be the 5K Park Run at Lytham. We would really like it if we could get lots of club members at the event to offer encouragement, cheer them on and if possible run the event. The progression that has been made in the last 8 weeks is fantastic. New friendships have been made and the impossible is becoming possible. To ensure that you qualify for the club handicap trophy, you must run at least two handicaps between January and May! The next club handicap is Tuesday the 29th March. If you are unable to run and are able to marshal, can you please let us know. TCRC on Tour! Malc and Julie Sherwood, with Ladies Captain Sue Jones! Sweatshop 10 Mile Road Race – Well the sun most certainly decided to put its hat on for Sunday’s race! The latest championship race saw 17 TCRC members at the start line! Dave Barras had a fantastic race to finish 45th overall, in an outstanding time of 1.06.31! Great Running Dave! Daisy Seville continues to show great form in her first ever 10 mile race and crossed the line in fabulous time of 1.14.49. This time awarded Daisy 2nd Vet 35! Go Daisy! Our Ladies Champion Caroline McLauglan had a brilliant run in 1.17.06, which saw her end the week on over 65 mile of running! Gillian Prior ran a fantastic race to finish in 1.24.24. Debbie Cardwell, who is on great form, ran a fabulous 1.32.56 and was followed by Dave Jones, who posted a new PB in a great time of 1.34.41. 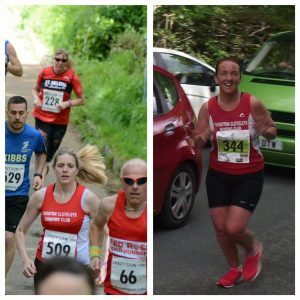 In their first races for the club, Karl Lucas and Carrie Simey smashed the 10 mile course and posted outstanding times of 1.38.45 and 1.38.57. Well done! Melanie Foster ran the perfect race to keep under 10 min per mile and finished in an awesome 1.39.56. After running 12 miles to the start of the race, Sarah Scott capped her 22 mile run off with a race finish time of 1.47.01. The ever smiling Simon Mason ran a fabulous race in a time of 1.49.54. The amazing Bev Foster and Jo Lickiss, having ran 6.5 mile to the start, ran a fantastic 1.52.07/1.52.11, this was followed by a further 3.5 mile run home! Mike Walsh had a great race and crossed the line in a brilliant time of 1.52.22. Sharon Randall brought the team home, after her 5 mile before the race, she finished with a smile in a great 2.09.58. Colin Denny and Lisa Young unfortunately had to pull out from the race due to injury! Speedy recovery to both of you! 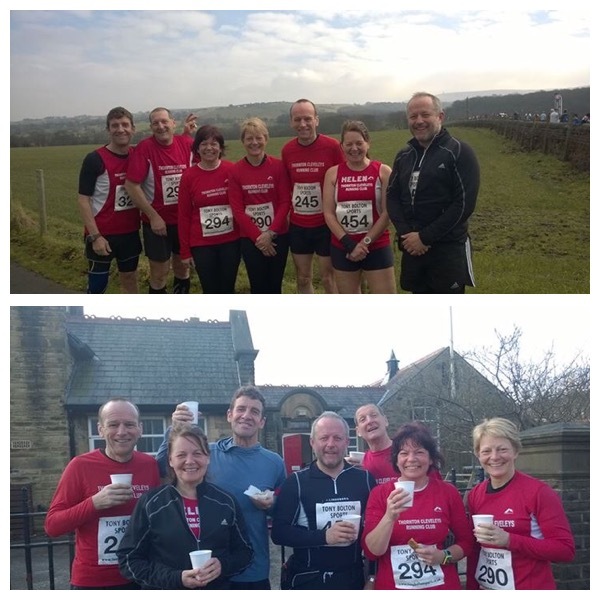 A big thank you to Julie, Malc, Andy, Lesley, Kirsty and Janine for marshalling and cheering the team on! Well Done Team TCRC! Roddlesworth Roller – 7 fabulous individuals represented TCRC in the second championship race of the weekend. Roy Tomlinson had a storming race to finish in 40th place in a time of 40.42! Steve Livesey continues to show great form and posted a brilliant time of 45.12. Steve Burgess showed his current outstanding form in a fabulous time of 52.00. Michelle Tomlinson ran a great race after running 20 miles in the week and crossed the line in 59.10. Helen and Don Jolly continue to impress in fantastic times of 1.02.42/1.03.36. Christine Burgess ran a perfect race and showed her great off road running ability in a time of 1.05.56! The Committee would like to say a huge thank you to Steve Livesey and Roy Tomlinson for all their amazing work and time given to the TCRC Committee. Roy and Steve have been a fundamental part of the committee and have recently decided to step down to allow new people to be appointed. On behalf of the TCRC team, thank you for all you have done and continue to do in support of the club! Next Sunday, 20th March, Thornton YMCA are hosting a Sport Relief 1 or 3 mile run on the field next to the YMCA. They have asked TCRC if we can provide any volunteers to help on the morning. It starts at 11am so they want any volunteers to turn up by 10.30. The YMCA have been very accommodating to the club providing a meeting place and changing facilities. We know there are several races on next weekend but if you could spare the time to help out it would be much appreciated. We have to supply the YMCA with the names of volunteers so, if you can, please email us at tcrc@ymail.com or see Christine on Tuesday. On Thursday evening we had 57 at the session. We have 5 weeks remaining of the beginners group and we are very excited to see them run the Lytham Park run at the end of the 12 weeks. At the end of the beginners course we will be having a get together on the Thursday evening at the Ashley Club. The evening is to celebrate the groups achievements and also give them so more information about the club, whilst meeting other members and having a drink. The Saturday after the last session (16th April) will be the 5K Park Run at Lytham. We would really like it if we could get lots of club members at the event to offer encouragement, cheer them on and if possible run the event. The progression that has been made in the last 7 weeks is fantastic. New friendships have been made and the impossible is becoming possible. A full list of the Club Championships for both road and trail, are on the website. 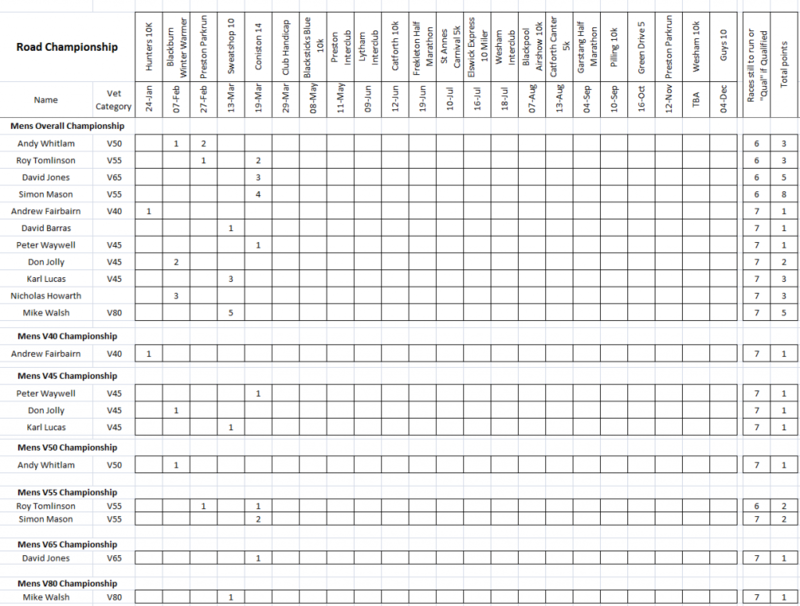 Next week the current club championship points table will be detailed within the report!